This is a one-skillet wonder that will leave you wondering why in the world this is not already one of your busy-day, go-to recipes. It's also a wonder in the taste department and this I can attest to as I made it last week before I got the dreaded cold/virus that has made me temporarily (I'm keeping my fingers crossed on that one) lose all sense of smell and taste for the last 48 hours!! Yes that's right people--here I am, writing and talking about food and even cooking it (because fortunately I don't feel sick enough to stay in bed and we still have to eat) and I CANNOT SMELL OR TASTE A THING!!! The irony is not lost me, it's like a big cosmic joke and kinda disorienting too--you don't realize how much you rely on your nose until all it's good for is blowing! Seriously, I should buy stock in Puffs Plus!! Anyway, apparently I made a delicious chicken dish last night (or so I'm told) and actually even ate a little of it too because I'm hungry but I might as well have been eating cardboard! If this keeps up, I'll be a rail for my son's wedding since what's the point of snacking?!! Guess it's all about perspective--silver linings and all that, right? Ok, enough whining. 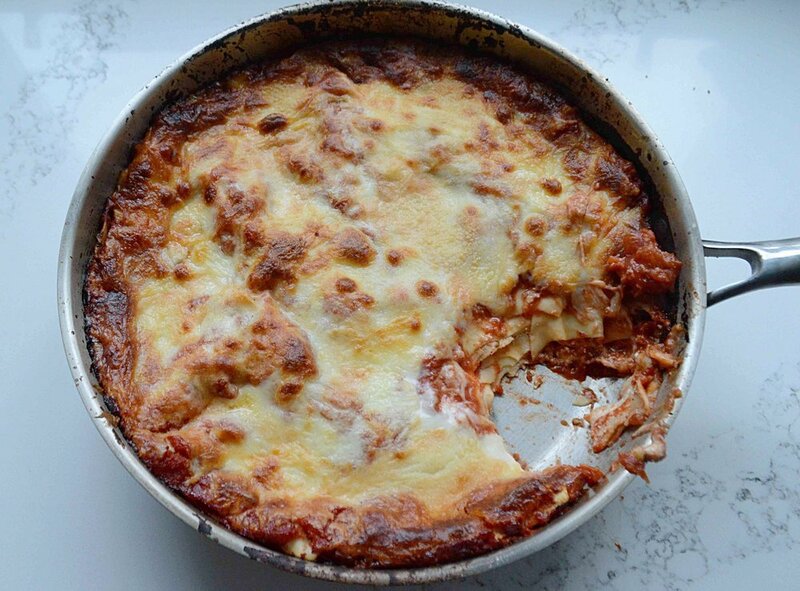 Let's get back to this truly tasty and truly easy skillet lasagne. It's the perfect Monday night meal, and vegetarian to boot if you do the Meatless Monday thing. 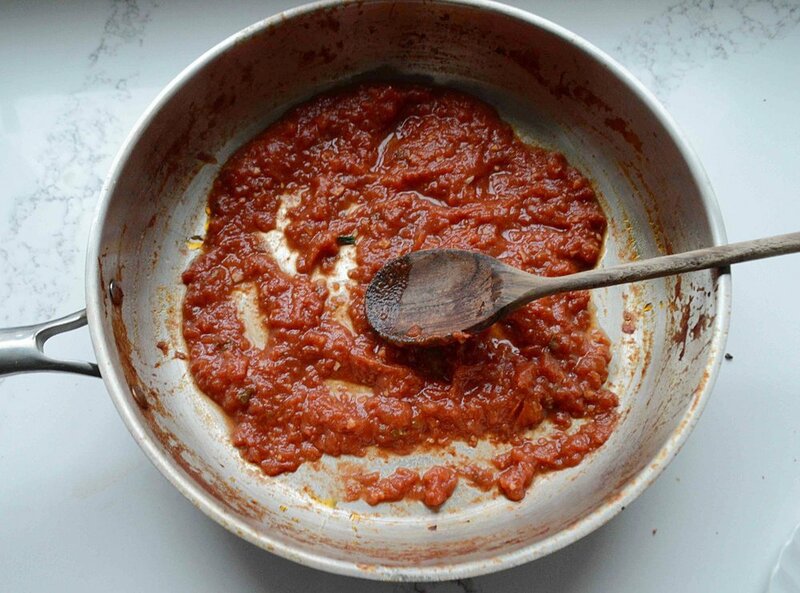 What makes it especially good and not just noodles, cheese and sauce in a pan, is that you make your own homemade tomato sauce. Don't freak out! It's super simple and comes together in minutes. And it tastes worlds better than sauce from a jar! Basically you just puree canned tomatoes in a food processor or blender and cook them down with some garlic and oil in the very same skillet you make the lasagne in. Which means...yup, you only have to wash one pan!! So it's easy on the cleanup side too!! And of course, we're using no-boil lasagne noodles so there's no annoying pre-cooking of the pasta. 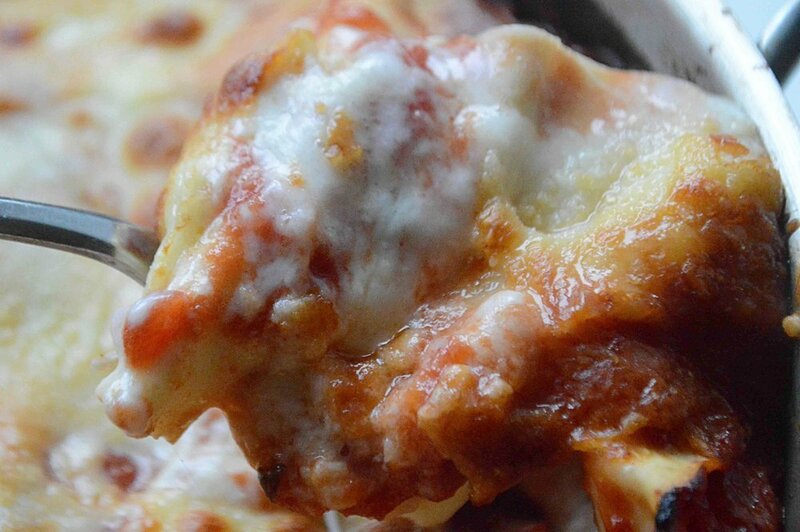 Once you've got your sauce, all you do is layer noodles, sauce, ricotta, mozzarella and Parmesan. Then you just pop that little round lasagne into the oven for about half an hour, toss together a salad or some other veggie and voila! Crunchy, cheesy top, tender noodles and a zesty sauce. True comfort food you don't have to slave over!! Doesn't get much easier than that! Kids will love it and so will you!! I guarantee you're going to add it to your regular repertoire. I know I am! Now go have an awesome Monday. And maybe wash your hands a little more than you usually do. There are so many germs out there and I don't want you to walk around with misery face too (my daughter's current endearing description of me and she's kind of right). 1. Preheat oven to 400ºF. Use a food processor or blender to coarsely puree the tomatoes. Then pour them into a large, deep oven-proof skillet. Add the garlic and the oil and bring to a boil. Season to taste with salt and pepper. Lower the heat so that sauce is only simmering and cook for about 12 minutes to allow it to thicken. 2. While sauce is cooking, mix the egg yolk, ricotta and a pinch or two of salt and pepper in a bowl and set aside. 3. When sauce is done remove the pan from the heat and transfer the sauce to a bowl. Do not wash out skillet. Add back in a cup of the sauce and spread evenly across the bottom of the skillet. Add a layer of the noodles, breaking them to fit the pan when necessary. Top with half of the ricotta mixture, using the back of a spoon to spread it around evenly. Repeat the noodle layer and then add about 1 1/2 cups of the sauce, spreading evenly. Top with another noodle layer and the remaining ricotta mixture. 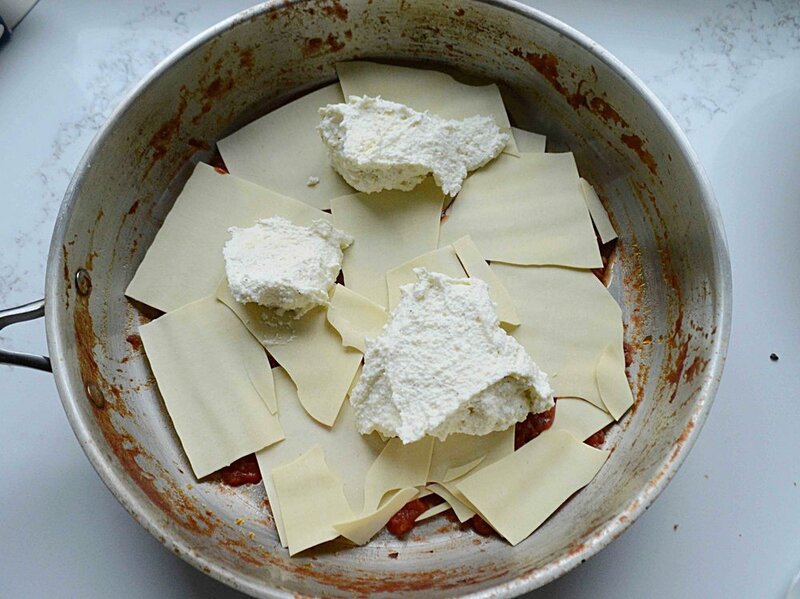 Add the final noodle layer, the remaining sauce (spread it out evenly) and sprinkle on the mozzarella and Parmesan. 4. Place the skillet into the oven and bake for about 30 minutes, until cheesy top is golden and sauce is bubbling. Let stand for a few minutes to set up and serve. Note: Recipe adapted from Martha Stewart. I doubled the amount of sauce and used a bit more ricotta and cheese.